Free Open Source Computer Planetarium ~ Android Forever! We've been having some unseasonably warm, cloudy weather for about a week or so in Central Florida, but we should be enjoying the cool, clear nights we typically get this time of year very soon. On those nights, nothing beats going out to the backyard and looking at the sky. In some of my very first posts on this blog I mentioned the thrill of seeing Saturn's rings and Jupiter's bands and moons through my telescope. But with or without a telescope, it is a wonderous thing to gaze upward and appreciate the magnificent vastness of the observable universe. Many people would like to learn about the stars and planets but think they have to spend lots of money for good software to do it. Not so, my friends. Tonight (at least for me it's night) I want to pass on a great software title that is absolutely free, and that will let you pan the night sky, zoom in to interesting objects, identify over 120,000 stars from the Hipparcos catalogue as well as the planets and their moons; there's a whole lot more you can do with this software that I don't have time to describe. I have this software myself. 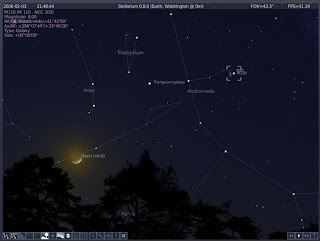 It's called Stellarium and you can get it here.